Sebastien Buemi has won the first of 2 races in London that will decide the 2014/2015 Formula E world championship. The Swiss driver has closed to within 5 points of championship leader Nelson Piquet Jr after taking pole position’s 3 points and the 25 points for winning the race. Additionally, e.dams Renault have clinched the constructors’ championship with their drivers finishing 1st and 7th. Nelson Piquet took 5th place behind both of his closest title rivals; with Lucas Di Grassi just one place ahead of him in 4th. They both missed out on the podium, with Jerome D’Ambrosio and Jean-Eric Vergne beating them to the rostrum. Sebastien Buemi was one of the six championship contenders heading into the penultimate race of the 2014/2015 Formula E world championship. He was trailing Nelson Piquet and and Lucas Di Grassi in 3rd place in the championship, but he kicked off his London ePrix weekend in the best possible style by grabbing the pole position and the 3 bonus points that come with it. Coupled to this, drivers were all saying how important it was to get pole position in Battersea park due to the tight and twisty nature of the circuit. Jerome D’Ambrosio, who had a mathematical but unlikely chance of taking the title this weekend, put his Dragon racing car in 2nd ahead of Di Grassi. Piquet Jr lined up 3rd as the first driver with FanBoost. Fellow boosted drivers included Oliver Turvey and Sakon Yamamoto. During the practice sessions prior to Qualifying and the Race the drivers and teams discovered a massive bump in the road on the run into turn 1. The bump was so big that the FIA decided to start Saturday’s race behind the safety car to prevent an accident. Sebastien Buemi has a brilliant start when the safety car came into the pits, with all the drivers maintaining position. Nelson Piquet Jr needed to find a way past championship rival Lucas di Grassi as soon as possible if he was to have a chance of challenging for the win. He used his first FanBoost to draw alongside and almost past the Audi Sport ABT driver, but Piquet started moving over too early. Contact was made which forced Piquet to jump the next chicane. Di Grassi held his position with Piquet falling into the clutches of Vergne, who swept by into the Millennium chicane. On one hand, Di Grassi will have been smiling when he saw that Piquet had fallen behind Vergne, but soon Vergne had caught up and was right on the gearbox of Di Grassi’s car. Sadly for Vergne he did not have FanBoost to help him get by. This didn’t stop him from pulling off one of the best overtaking moves of the year by lunging up the inside into the final chicane. He locked both wheels of his Andretti, but he still got the car stopped and into 3rd place. The pit-stops began at the end of lap 14, with nelson Piquet Jr uncharacteristically eating through his energy to be the among the first to pit. Vergne and Di Grassi joined him along with Turvey, Duval, Heidfeld and Leimer. Vergne held his track position from Di Grassi and Piquet, with race-leaders Buemi and D’Ambrosio coming in at the end of that lap. Those who hadn’t the first time around came in the next time by with the exception of Bird who pitted one lap later and re-joined in 9th. A disappointing home race so far for both Bird and the Virgin team; who announced prior to the race that they would team up with Citroen’s DS group for next year. The was a high chance of a safety car thanks to the bumpiness and the tightness of the London ePrix circuit. The Qualcomm safety car finally made it’s appearance at the end of lap 17 after Daniel Abt put his Audi Sport ABT car into the wall at the final turn. The car seemed to have an issue with under-steer, with Abt running wide 3 rimes before finally parking itself in the wall at Chelsea-Gate. The safety car came in at the end of lap 20 of 29, with Buemi sprinting off. D’Ambrosio stayed in touch with Buemi this time, with Vergne behind ahead of Di Grassi and Piquet. Piquet was soon all over the back of his fellow-countryman and rival Di Grassi. He had to pass him not to just extend his lead on Di Grassi, but also to limit the damage done by race-leader Sebastien Buemi, who would close up to within just 3 points heading into tomorrow’s final race should the positions have remained as they were. He almost drew alongside into turn 3, but he couldn’t make it stick. He used his final FanBoost to get slightly closer, but that didn’t work either. He was practically inside Di Grassi’s gearbox as the pair approached the Millennium chicane, with Piquet just holding onto the rear of his car to prevent the pair of them from crashing. Soon after, Piquet went quite wide at turn 1 which then cost him time to Di Grassi who pulled away slightly; with Lucas then taking the fastest lap next time around. He took the fastest lap and the 2 bonus points away from race-leader Buemi. Di Grassi’s lap put him within touching distance of Jean-Eric Vergne for the final position on the podium with just 3 laps to go in the first race at London. 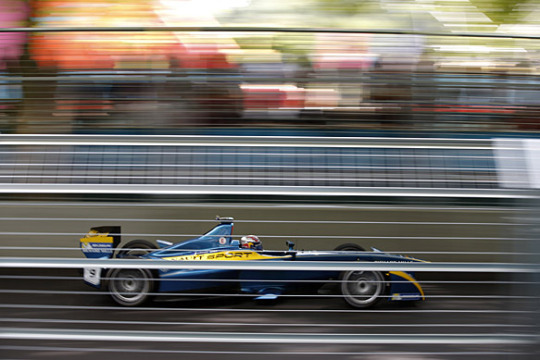 Up at the front, Sebastien Buemi had driven a brilliant and controlling race in his e.Dams Renault. He would cross the line to take his 3rd Formula E race victory which puts him well and truly in the fight to take the championship tomorrow. He now trails Nelson Piquet Jr by just 5 points. Buemi’s win, along with his team-mate scoring 7th, was enough to seal the 2014/2015 Formula E constructors’ championship for e.dams Renault. Jerome D’Ambrosio took a superb 2nd place ahead of Jean-Eric Vergne; with the Frenchman holding off a late charge from 4th placed Lucas Di Grassi. Lucas denied Buemi from taking the maximum points on offer by stealing the fastest lap by 3 tenths. Championship leader Nelson Piquet Jr may have held his championship lead for another day, but with Buemi just 5 points behind and seemingly one of the fastest in London, he will now be worrying ahead of tomorrow’s 2nd qualifying session and race that will decide the championship. Piquet held off Sam Bird, who charged through after a slow pit-stop to take 6th place ahead of Nicolas Prost. Loic Duval put his Dragon racing car in 8th place to make it a double points finish for Jay Penske’s team. 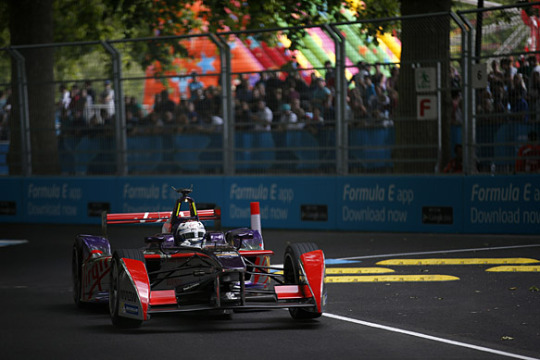 He finished ahead of Formula E debutante Oliver Turvey in 9th; with Stephane Sarrazin taking the final point in 10th.